Foiled choices will have silver foil. The leather is branded with heat to make the indentations of the letters. Shapes will be lighter than letters due to being a decorative shape. 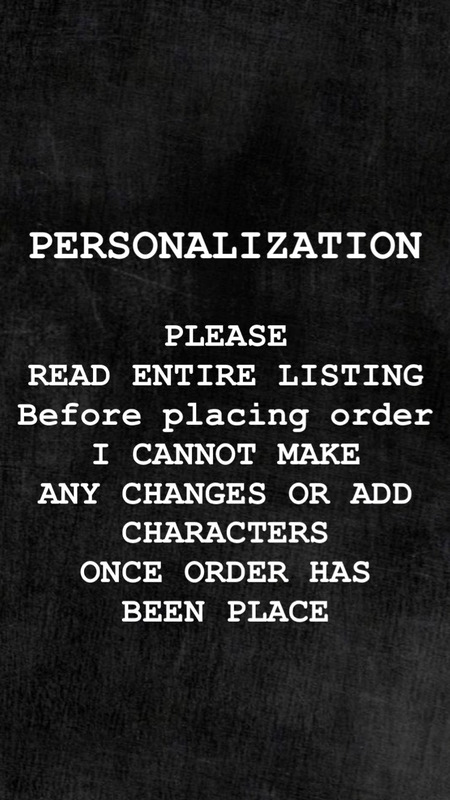 ***We cannot accept requests nor changes once an order has been placed. If an option is left unanswered or unmarked I will choose the best option. Once an order is placed there are no cancellations. We appreciate your patience and support. All items are shipped first class with insurance. cost is determined by package weight and location. Insurance and supplies. Combined shipping is not available. All orders are shipped individually. International orders ship first class and are not insured. If insurance is required please contact mlgandco at info@mysticslittlegifts.com for quotes on insurance. Door to door global starts at $30 US dollars and up depending on weight of package and location. If a package is lost please contact your local post office to file a claim with the tracking number that was provided. All US orders are insured. I am not responsible for lost or stolen packages. RETURNS: We accept returns on certain products. Totes, purses, pencases, cardholders, pouches, and all other accessories are not returnable. If your planner has more than a 1.5” spine then your order CANNOT be returned. To start your return process please contact Mlgandco for instructions and return address. You have a 10 day window from receiving your order and contact MlgandCo to start the return process. You will be charged a 15% restocking fee. I put a lot of time in the designing and construction of your cover and cannot get this time back, everything is made to order and i do not keep items in stock. Return shipping is the customers responsibility. We suggest using priority mail as it provides insurance and tracking. Please kindly give us 24 hours to process you return. QUICK INFO: All covers are made on the slight roomy size. Regular (1” spine) comes with 4 elastics. Wide (1.5” spine) comes with 6 elastics. Xtra Wide (2" spine) will automatically come with 6 elastics and can be upgraded to 8. The spine piece for the one inch and one and a half inch are the same size piece if you choose reinforcement option. Each listing is for that specific leather and the listing has a brief description of the leather. Elastics are matched to thread where there is no option. The larger the spine the wider the cover will be. Order notes are not always a guarantee... PLEASE READ THE LISTING. LEATHERS: ALL lines are around 5 oz in weight give or take. Some are very flexible some are very structured and firm each listing has a brief description on the leather line. All leather has imperfections, tannery markings, scars, blemishes, and some type of life . DEFECTS ARE NOT: hide variations or color differences, branding is not a defect and other stamps inside covers are NOT defects, leather blemishes are not defects. A defect will be in construction, (example: spine that is not at center on a cover by 1/4” or more) remember this is handmade so it will have slight construction imperfections. Leather is very FRAGILE I am not responsible for wear and tear and chemical damage to the leather. Please use a pouch or some other type of protection for your leather. How others see you is not important, how you see yourself means EVERYTHING. This business is ran by a mom, a wife, a woman, a human. My name is Ana and I am the creator and owner of Mystics Little Gifts. I am a mom and a wife. We are a pet friendly family . Our chi Rosco , Zephyr our feline princes and Malkovich our Russian Blue boy. I started In the fall of 2016 back when I discovered travelers notebooks. I wanted one and so did my daughter as we have been life long planners. We couldn't afford them and thats how we came up with the first mlgandco tn made from a vinyl placemat from walmart. So Out of a need.... or should I say out of a want ;) I have never been very crafty, I tried scrap booking and wasn't good at decorating but I found a love and an art working with leather. I hope you enjoy looking at my site and find something that calls to you. I make every cover as if it was my own and put everything i have into it. All are handcrafted by myself and sometimes the hubby. I trim them all with my rotary cutter and ruler. Then they are glued and sewn by my sewing machine. Every single cover is created with lots love and a sprinkle of sweat and blood. To create something beautiful you cannot rush.